Summer is in full swing, and as you make plans for the upcoming 4th of July holiday weekend – there are several things to keep in mind to ensure your family stays safe. Heat exhaustion. Temperatures in Houston are creeping into the mid-90s, and it won’t be long before we’re dealing with the triple digits. Outdoor activities must be accompanied with plenty of hydration. Failing to do so can lead to overheating, which can be potentially dangerous. Children under four years old are at a higher risk. Heat exhaustion symptoms include headaches, nausea, loss of consciousness, and minimal sweating. If a loved one is experiencing overheating symptoms, make sure they rest, move to a cooler place, and drink cool water or sports drinks. The Mayo Clinic recommends you call 911 if body temperature reaches 104°F (40°C) or higher. Swimming. If taking a dip in the pool to stay cool, make sure everyone knows how to swim well. The summertime is the perfect time to enroll in a water safety or CPR/AED course. Check with your local YMCA or Red Cross for more information. The American Red Cross recommends children use a buddy system with an adult. Young children are not to be left alone with other children near a pool, and while supervising little ones, do not let your guard down or allow distractions take your attention. 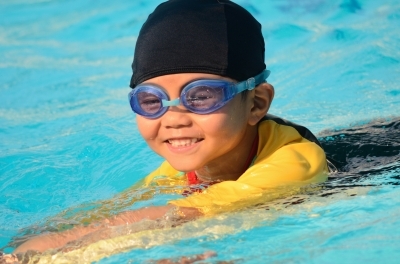 If your child is not an experienced swimmer, have him/her wear a life jacket near the water. In the case that a child should disappear from your presence, check the water first, as seconds count in preventing serious injury or death. Fireworks. No 4th of July celebration is complete without fireworks. Before purchasing fireworks, make sure they are legal in your city or neighborhood. Fireworks are illegal in Houston city limits as well as parts of Harris County. If you’re illegally caught with fireworks, you can face a fine between $500 and $2,000 for each individual firework. According to the U.S. Consumer Product Safety Commission, small fireworks, such as bottle rockets and sparklers, hurt approximately 1,000 children under five years old during the 30 days surrounding the 4th of July. If your city does allow the use of fireworks, make sure your family follows safety guidelines by CPSC. Young children are never to be allowed to play with or ignite fireworks. 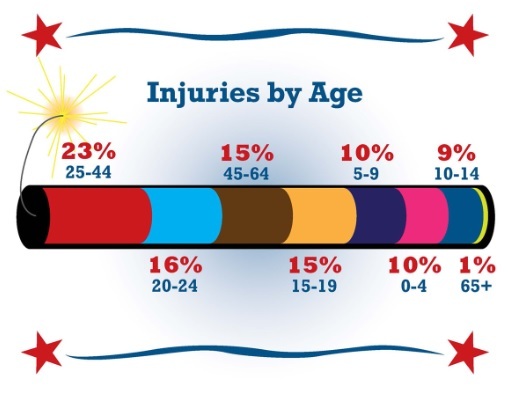 Children under nine years old account for 20% of firework-related injuries. Experts also recommend to not position any body part directly over a firework when lighting the fuse. 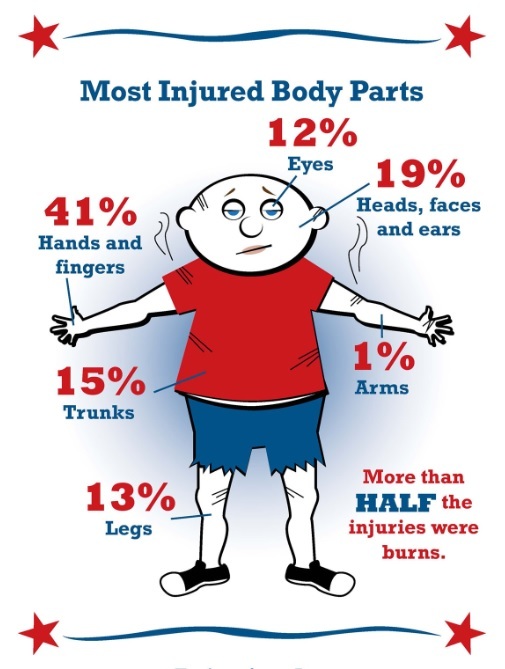 More than half of injuries related to fireworks are burns. At 41%, hands and fingers account for the most injured body parts. Additionally, the head, face, and ears make up for one in five of injuries. The safest way to enjoy fireworks may perhaps be by attending one of a number of 4th of July celebrations around Houston. The Houston Convention and Visitors Bureau has compiled a list of family-friendly activities around the city. Summer safety kit. If heading out of town, the Texas Children’s Hospital recommends packing a summer safety kit with several essential products that may come in handy in a trip. Purchase a sunscreen with a strong SPF, and apply it 15 minutes before going outside. Sun block must be replied every two hours when swimming or sweating. 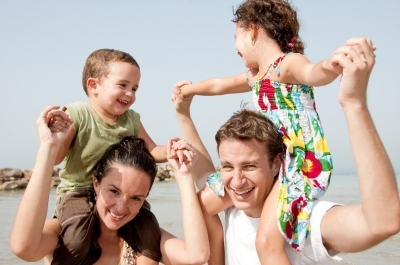 Make sure to be aware if your child is sensitive to high SPF. Keep other first aid essentials, such as antibiotic ointment and bandages for scratches and cuts. Also include children’s pain medication for minor aches and pain. Carry insect repellent with DEET as an active ingredient. However, use the lowest-strength DEET possible, and avoid insect repellents that contain citronella, which tends to be less effective. If your child does get bit by insects, make sure you have an anesthetic to relieve itching. Also pack all necessary items for children with special needs, such as inhalers and testing equipment. If you’re staying home for Independence Day, check out our Pinterest page for plenty of 4th of July-inspired activities.